The return of NFL football kicks into full gear this week and continues with a battle between the Pittsburgh Steelers and the New York Giants. Preseason games are a time for teams to find out exactly who will be playing for them, whether it be specialists, rotational guys, or full time starters. Below, PFF’s team of analysts have all the most important position battles and players to watch during today’s game. After cutting Ladarius Green the team seems happy with Jesse James, Xavier Grimble, and David Johnson to be on the field when the Steelers need a tight end. James played sooner than expected, being on the field for 80.3 percent of snaps in 2016 after only 17.1 percent his rookie year. He finished the year with a 50.0 overall grade, and although he saw more than double any other returning tight end in targets, his 0.88 yards per route run were the third lowest among tight ends with at least 30 targets in 2016. James held down the middle, as 48 of his 72 targets were between the numbers and none of those were farther than 20 yards downfield. But James is listed as the starter in the team’s unofficial depth chart entering the first preseason game. While Grimble on the other hand was only on the field for 204 snaps last season but his 16 percent threat percentage is the highest on the team among returning tight ends. And Ben Roethlisberger’s passer rating when targeting Grimble was 100.9, the best when Roethlisberger targeted any Pittsburgh tight end in 2016, better even than Green. But Grimble does need to work on his consistency to be considered for the starting position, his drop rate of 15.38 was the fourth highest among any Steelers pass catcher. 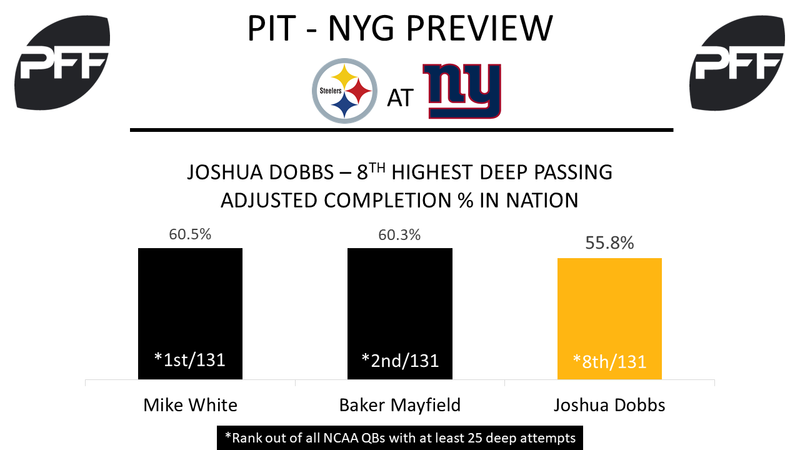 With Roethlisberger resting and Landry Jones injured, Dobbs will start this game and look to take advantage of the time and elevate himself ahead of Jones to claim the backup quarterback spot. The former Tennessee Volunteer excelled last season under pressure, his 12 touchdown passes under pressure were tied for the most in the nation. And like Roethlisberger, Dobbs enjoys throwing the deep ball and does well at it. With an adjusted completion percentage of 55.8 percent on deep passes, Dobbs ranked eighth in the nation in 2016. The Steelers fifth-round pick also could enjoy using running backs like Le’Veon Bell on the roster, he threw to his running backs 17 percent of the time and had a passer rating of 124.7 doing so. Watt terrorized offenses in the Big Ten and throughout the nation last season with his pass rush ability. The former Wisconsin Badger had the fifth best pass-rush productivity (16.7) in the nation among 3-4 outside linebackers. But Watt is no push over in the run game either, his 21 stops in the run game ranked tied for 23rd. The Steelers are hoping he can spell James Harrison and pair with Bud Dupree to bring the pressure from each side of the field for years to come. Watt will have plenty of chances this preseason to show that. 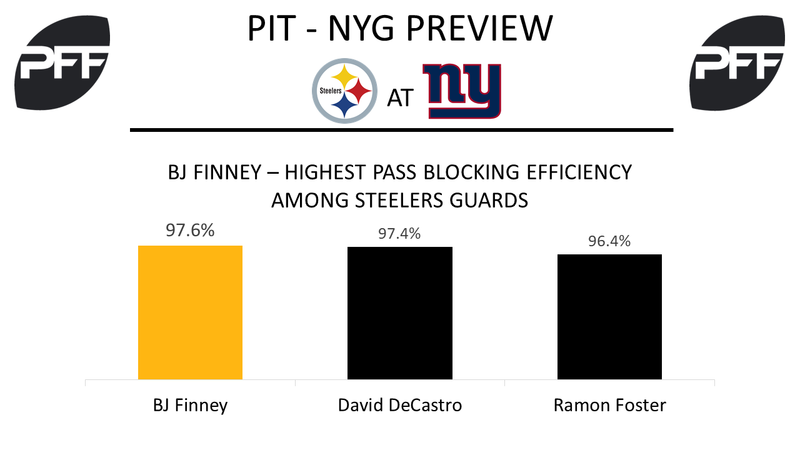 Finney was named the starting center for the Steelers after Maurkice Pouncey had been ruled out of the first preseason game, showing that he should be the teams primary backup interior lineman. The Kansas State product spent time at both center and guard in 2016 and only allowed five total pressures in 172 pass block snaps, the least by any Steelers lineman to play at least 150 pass block snaps. He earned a grade of 76.0 in his limited action, the highest of any backup Steelers lineman and will be looking to improve on this this preseason. This Giants team comes with fewer question marks than others in recent memory. At this point in training camp the biggest battle is who will backup QB Eli Manning. Johnson thrived off of play action last preseason using it on 26 percent (sixth most of 85 quarterbacks) of his drop backs. 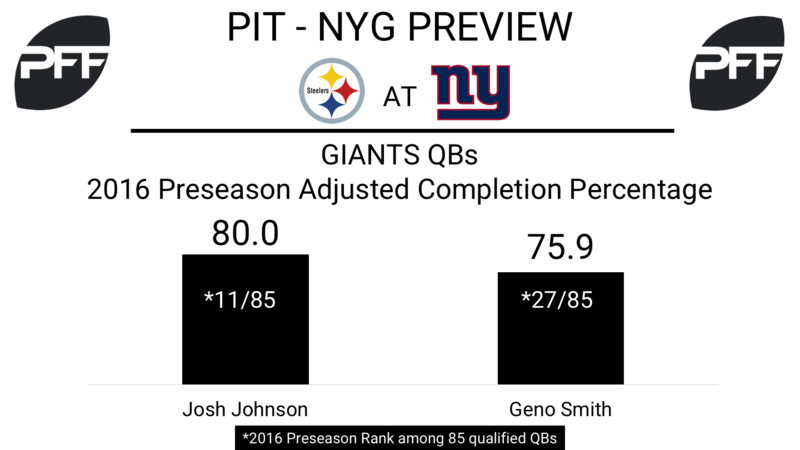 While Smith was slightly less accurate last preseason, his receivers didn’t help him out, dropping five passes – the fourth-worst (15.6 percent) drop percentage of 85 quarterbacks. A former top 10 pick in the 2015 NFL draft, Flowers has disappointed thus far into his career in New York, earning grades of 35.5 and 50.2 in 2015 and 2016, respectively. Over the past two seasons he’s allowed the most total pressures (128) of any offensive player in the league. Chad Wheeler would potentially be the player to take his starting spot. Thompson only played 88 total snaps last year, with rookie UDFA Andrew Adams taking his spot and performing well (78.8 grade, ranked third among rookie safeties) once he cracked the lineup. In his final year at Boise State, Thompson ranked seventh in the nation in run stop percentage (9.3 percent) among 338 safeties. He also nabbed five interceptions and had six pass deflections in coverage during his senior season. The Giants lost DT Johnathan Hankins in free agency this offseason to the Indianapolis Colts and decided to replenish in the second round of the 2017 NFL draft with Alabama’s Tomlinson. One of the elite run defenders in the draft (87.1 run defense grade – 17th in nation), he sheds blockers with ease and can hold up to double teams well. Tomlinson also adds pass rush ability –something Hankins didn’t – as he accumulated 70 total pressures in college utilizing his club-swim, bull, and bull-jerk rush moves.